Most people wear as much sweatshirt material on their person as possible while flying. I prefer a cute early 60s dress. Alas, I did not get any pictures of me frolicking around in the airport or garment district in this dress so I wore it again on Sunday with my new petticoat for some pictures! Wear again? Yes! And I'll probably sew with this pattern again! It's a great shirtwaist dress pattern and fits me wonderfully! With a different collar, it could easily work for 50s too. I know sewing garments with quilting fabric is a big no no, but I just couldn't resist these cute little 50s/60s girls! I wore my new crinoline and was super poofy! I do not recommend a crinoline for air travel though. I paired this dress with a velvet vintage black belt. 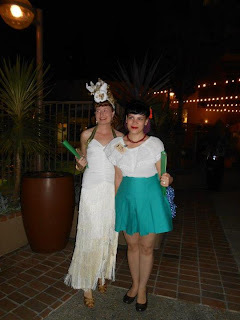 Thursday night at Costume College was also the Carmen Miranda pool party. I didn't get any shots but here are a few from around the web. Me and Lauren M. She had a great fringed white dress and butterfly turban like the one at the end of this post. I wore my Mexican blouse and my new Wearing History Rita shorts. These shorts will be getting their own in depth review post later but they are so awesome! At least there's still enough summer left to enjoy them properly. Me and Ginger. 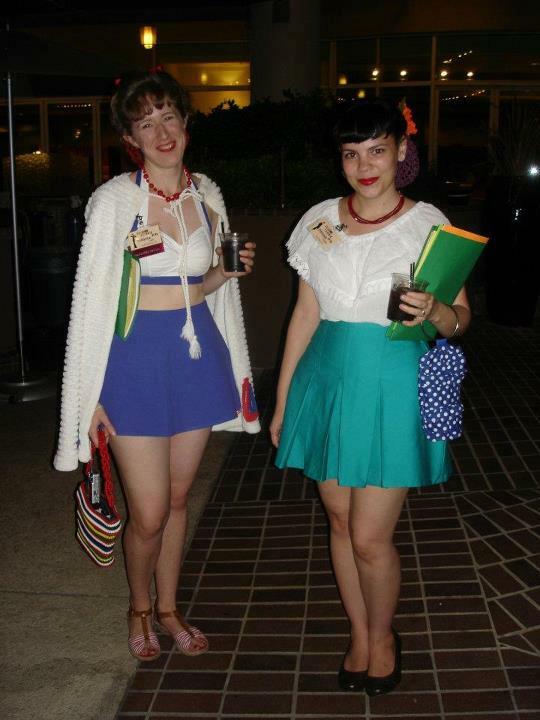 She also went 40s with a fabulous vintage chenille cape. Very cute dress. I don't know who said quilt fabrics are off limits - I use it for garments all the time and make no apologies(sorry if that offends any quilters):-) It isn't like there are a bunch of fabric designers out there rushing to produce awesome cotton prints for garment sewing:-( Besides, many original, authentic vintage pieces were made from recycled flour and sugar sacks!! Quilting fabric is pretty high quality by comparison. I love your blog, by the way, and will be adding you to my blog roll if you don't mind. That fabric is so, so wonderfully cute! I have a dress (repro) that's made in a somewhat similar fabric, however instead of cute gals, it features darling little fairies. Oh, I love the Rita shorts!!! So cute! And there's no law saying you can't use quilting fabric for a frock. You're the one who is going to wear it anyway. It is just darling! I sew vintage dresses with quilting cottons ALL the TIME. Reason being, the prints are more fun and I'll be darned if I'm going to sew with boring prints. If it's wrong, I guess I don't want to be right. Very cute! I love the shorts too. I'm another who sews with quilter's cotton all the time too. It makes the skirts of dresses sit so nicely. I also sew with quilting cotton. Some of my loud shirts have been made with this fabric. There are such fabulous patterns and designs. I also like the crisp drape it has. The fabric softens with each wash but still hold up draping well.